Are you looking for bagged Reddy Ice for your next event or party? Argyle Feed Store now carries bagged ice from Reddy Ice, America’s number one leading ice supplier in the store. Whether you are preserving perishables or keeping those cocktails nice and cool, this bagged ice is the quality ice you are looking for. It is crystal clear, odorless, tasteless, and long lasting cubes that will sure to please your guests. In 1927, Southland ice was founded and included eight ice plants and 21 retail docks, also currently known as convenience stores. As America enters World War II in late 1941, the demand for ice and other chilled products grew. Southland Ice expanded its operations by acquiring Oak Farms Diaries and City Ice Delivery Ltd, allowing them to expand their business in ice manufacturing and retail stores. As time went on Southland Ice continued to grow and took over various convenience companies and established 7-Eleven’s all over the country. The packaged ice business was eventually rebranded as Reddy Ice Division, the largest ice operation in the world at that time. Today, Reddy Ice still stands on the original foundations; innovation, exceptional products and outstanding customer service. This commitment to excellent food grade quality manufacturing methods and distribution logistics is what makes them number one in the ice industry. Not sure how much ice you need for your event? No worries! 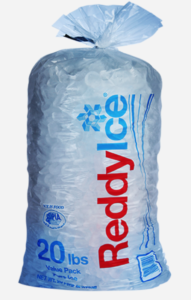 Check out Reddy Ice’s Ice Calculator to help you find out exactly how many bags you need. This entry was posted on Wednesday, February 28th, 2018 at 4:33 am	and is filed under News & Updates. You can follow any responses to this entry through the RSS 2.0 feed. Both comments and pings are currently closed.